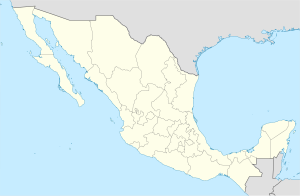 Ayutla de los Libres (Mixtec: Tatioo) is ane o the 81 municipalities o Guerrero, in sooth-wastren Mexico. The municipal seat lees at Ayutla de los Libres. The municipality covers a aurie o 735.4 km². As o 2005, the municipality haed a total population o 55,954. The name "Ayutla" comes frae Nahuatl Ayotlan meanin "near the (place o abundance o) tortoises/turtles". The sobriquet "de los Libres" ("o the Free") wis addit efter 1854, acause the toun wis the place whaur the Ayutla Revolution stairtit on 1 Mairch 1854, an whaur the Plan o Ayutla wis annooncit. ↑ "Ayutla de los Libres". Enciclopedia de los Municipios de México. Instituto Nacional para el Federalismo y el Desarrollo Municipal. Retrieved December 23, 2008. This page wis last eeditit on 11 Mairch 2018, at 07:30.